The 2017 Qatar Masters golf tournament on the European Tour is taking place this week from January 26-29, 2017, at the Doha Golf Club located in Doha, Qatar. Here is a list of the playing field for the 2017 Qatar Masters focusing on the top players. 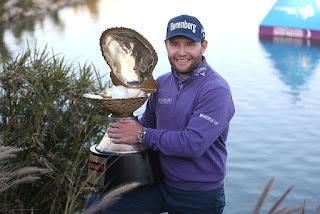 The winner of the Qatar Masters the last two years in 2015 and 2016 was Branden Grace who is currently ranked 17th in the world. Unfortunately Branden Grace is not in the playing field this week to defend his title. Top ranked golfers in the playing field include Alex Noren, Rafa Cabrera Bello, Chris Wood, Bernd Wiesberger and Andy Sullivan. All those players are in the top 50 in the world. Golf major winners in the 2017 Qatar Masters playing field not listed above include Ernie Els and Trevor Immelman. To date, no American has won the Qatar Masters. Trying to break that record in 2017 are Americans Paul Peterson, David Lipsky and Daniel IM who are all in the playing field this week. All in all the 2017 Qatar Masters playing field is not particularly strong but it's deep enough to ensure a very competitive European Tour golf tournament this week in the Middle East.